Google Tag Manager is a tool to manage tags on your website. If you are using many tags like Google Webmaster Tools, Google Analytics, AddThis etc., you should consider adding Google Tag Manager, which loads tags asynchronously making your website load a lot faster. Sign in or Sign up for free. In your account enter "Admin". In the first field type any account name and continue. In the second field enter site address, select "WEB" and "CREATE". After website reloads, a new window will appear with two codes that need to be pasted on the website. 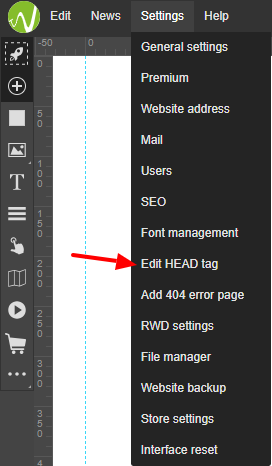 Go to website builder WebWave, enter Settings and in "Edit HEAD tag" paste the first code. Replace "Your_code" to the second Google code. Save changes and publish your website. Click here to chat with us. Free website builder WebWave makes creating websites effortless. You can start building your website either from scratch with a blank page or, if you are looking for some inspiration, with a free template. Web design software for free? It is easy! Didn't find a solution to your problem? Contact us on live online chat or ask on Facebook group. Missing any feature? Share your ideas with us.